Get the latest industry news, deadlines and tips you need to know to help tackle your fiduciary responsibility needs. In multiple lawsuits, Fidelity Investments is being accused of charging excessive, undisclosed 401(k) fees. At issue is an “infrastructure fee” the company demands from some third-party mutual funds in return for access to Fidelity 401(k) clients. Fidelity claims the fee is not 401(k)-related. The lawsuits claim otherwise, saying the fee represents indirect compensation – a form of 401(k) fee that Fidelity must disclose in a 408b-2 fee disclosure to be legal under the Employee Retirement Income Security Act (ERISA). 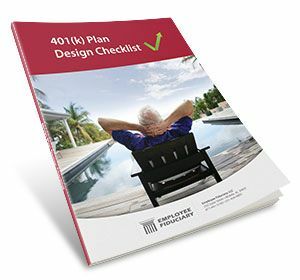 Subscribe to the The Frugal Financial Small Business 401(k) Blog and receive this free checklist for help in determing the best 401(k) plan design options and fit for your company. A 401(k) plan may, but is not required to, allow participants to take a hardship distribution in times of financial stress. This type of 401(k) distribution can be a financial lifeline when someone has nowhere else to turn for cash. Last year, the IRS released a proposed regulation that made several changes to the 401(k) hardship rules, generally relaxing how and when these distributions may be taken. Both employers and 401(k) participants should understand how the regulation will affect their retirement plan.